Product: Montana Timber Products Exterior use of AquaFir™ Dark Gray siding with AquaFir™ Bronze Cedar soffit and trim along with Interior Product featuring Corral Board. 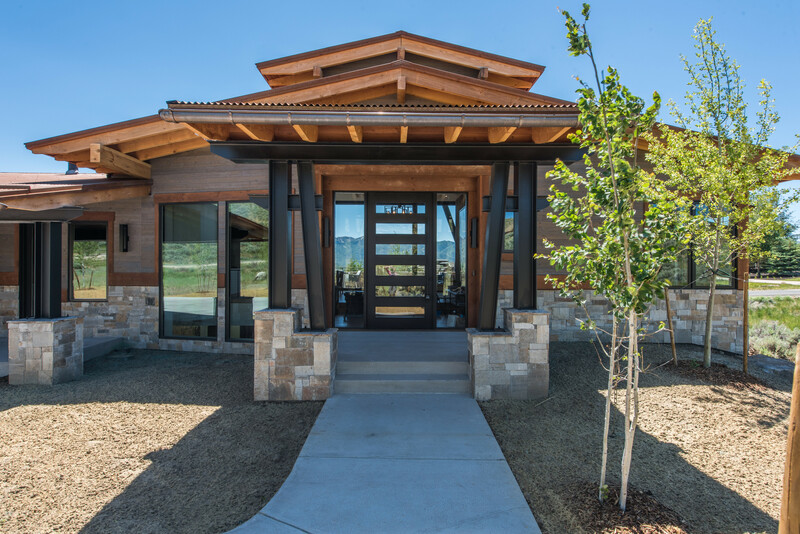 Product use: Beautiful Park City Utah home features a mixture of AquaFir™ wood products to compliment the stone and metal used in the design of this modern rustic home. The AquaFir™ product utilizes a finish that optimizes natural variation and texture of the wood to highlight the modern colors available in this product. By using two colors with the other natural building materials it gives the home a warm and interesting façade. AquaFir™ Circle Sawn Dark Gray ship lap horizontal siding with a AquaFir™ Circle Sawn square edge Bronze Cedar window, door trim and soffits. Mixing the wood colors allows for a warmer exterior to balance the aesthetics of the design. The two story patio brings the eye up to the soffit, AquaFir™ circle sawn T&G Bronze Cedar, beautifully constructed to hold up in the extreme temperatures in the Utah mountains. The interior of the home displays a Corral Board square edge wall just inside the front doors as a beautiful accent of rustic décor on one side and the modern metal staircase on the other side. Displaying the boards vertically elongates the ceiling height for a grand look. All materials are pre-finished and come ready to install. Montana Timber Products feature Seal-Once allowing the beauty of the natural wood to shine through while being protected from the elements.